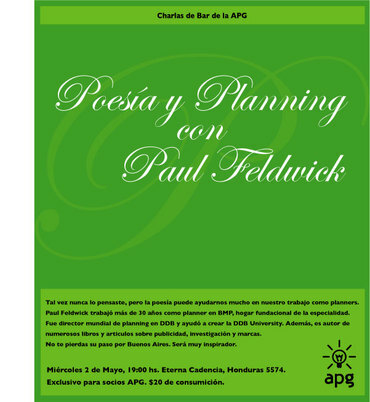 Last night was the first APG planners evening in Buenos Aires for this year. It was quite a small group of friendly planners who got together in a bar for a chat and then listened to Paul Feldwick talk about Poetry and Planning, and recite a few wonderful poems too. I love watching people transform themselves as they read poetry, in fact it happens when reading scripts too I suppose. The idea that poetry is "about showing rather than telling" was the most tangible link to planning for me. When we talk about communications and engagement, isn't that exactly what we're getting at? We want people to feel, experience, live and share the message inside the communication. Maybe we need to get poetic a little more often. It's would be quite a challenge to manage it in a busy office I think.